I think it's time for a little clarity. The Fight for Dyett is not resolved. The mayor's Frankenschool solution created without a single stakeholder, and imposed autocratically ("we are not negotiating"--Forrest Claypool) solved nothing and indeed, despite Eric Zorn's crowing about how well hunger strikes work, and hooray, it's over, and ding dong the witch is dead, the strikers are still striking. 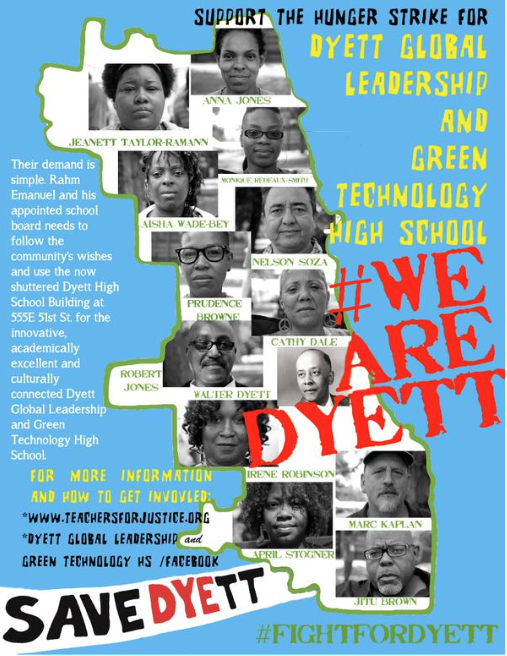 Furthermore, the Fight for Dyett is not 12 people trying circumvent "procedure" and "bully" the mayor. It is 12 people standing up and saying no. No more. We will accept no more manipulation of our schools and our communities for the pleasure and the benefit of the political class. But it is bigger than that. It is many people who are saying no to the manipulation of our schools and our communities for the pleasure and benefit of the political class. It is hundreds of people. Thousands maybe. Thousands upon thousands. It is certainly Chicago-wide and it reaches well beyond our state and across the globe. The Fight for Dyett is being waged by 12, yes. But it is supported by many. It is supported by many who are tired of the destruction of our public schools.. . .